Recently, a friend asked me to help replace the alternator on his wife's 2004 Toyota Camry. This is the 2.4L 4 Cylinder Model. While driving, she heard a loud noise, which turned out to be the serpentine belt being thrown from the alternator pulley, which had gone bad. Since an Alternator is a quick job, usually less than 30 minutes, I hopped in the truck, grabbed my basic tool kit, and headed over to pick him up. However, after replacing the alternator and going to put on the serpentine belt, I noticed that someone had broken off the tension release nut. To be fair, we had noticed this before beginning work, but had hoped to be able to come up with a solution for getting the belt on. The tension release bolt is a 19mm nut that is on the top of the tensioner pulley assembly. By pushing down on the nut, the tension pulley moves down, allowing the serpentine belt to be removed or installed. 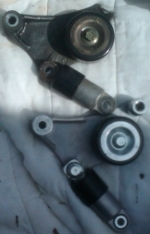 As you can see from the picture on the left, his tensioner drive belt assembly was broken and there was no way to safely and easily release tension on the pulley. You can check out Toyota's 2AZ-FE Engine Mechanical document for more details. 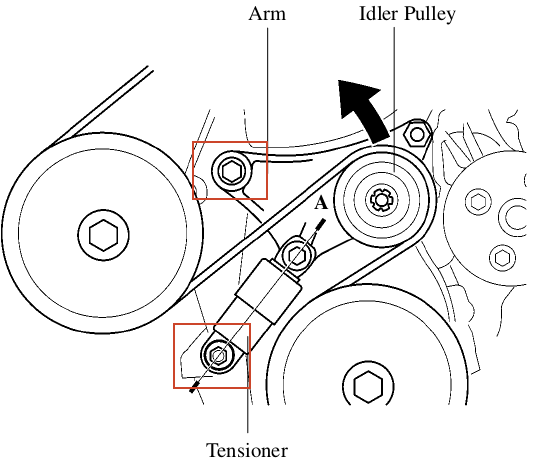 The diagram on the right shows the tensioner assembly, including the top bolt and bottom nut that must be removed. These are secured to the egine and the only tricky one is the top bolt, which can not be removed without lifting the engine slightly. This is the Hydraulic tensioner assembly, but there is also a spring model. They should be interchangeable though. The steps are described in more detail below, but the tensioner is held in place by a 14mm bolt and a 14mm nut. The top bolt on the tension pulley can be unscrewed by removing the top engine mount and removing the nut from the top of the bottom passenger engine mount. 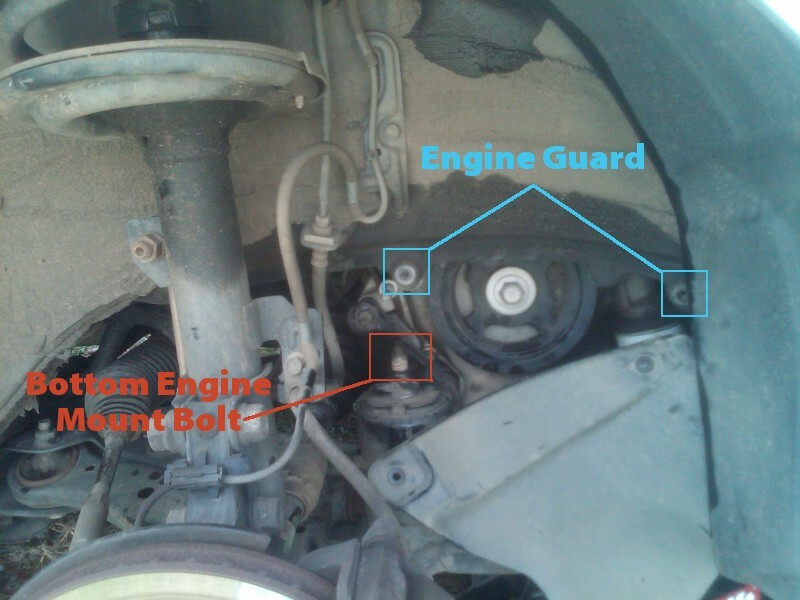 The image on the left shows the engine guard and bottom engine mount bolt, which can be accessed by removing the passenger side tire. Then, by carefully jacking up the engine slightly, it is possible to put a ratchet on the top bolt on the tensioner, removing it. Remove Negative lead from battery. If the serpentine belt is still attached, remove it. If the tensioner is broken, it may be necessary to remove the middle bolt in the tensioner and or cut off the serpentine belt, depending on its quality. Carefully jack the passenger front side of the car up, placing a jackstand under it. Remove the front passenger tire. Remove the two bolts holding the engine side splash guard in place. There are actually three+, but removing two allows the guard to be moved out of the way. Place a block of wood on a jack and place it under the engine oil pan, applying only enough pressure so that the block does not move. Remove the nut on the top of the bottom engine mount, using a 19mm socket. Remove the bottom nut holding the tensioner in place. Carefully jack the engine up, being careful not to damage the engine pan. Jack it ONLY enough so that a 14mm 6-point socket can be placed on the top tensioner bolt. Carefully remove the top tensioner bolt, using a break bar if necessary. The Tensioner should easily come off. Installation is the reverse of above. When lowering the engine, make sure the motor mount slides onto the exposed bolt. It may be necessary to carefully use a pry bar, only slightly, to correctly position the engine onto the motor mount. The middle bolt is a pivot bolt and does not connect to the engine. Removing it allows the tensioner assembly to be freely moved. Belts cost over $20, so unless it is overly worn or damaged, cutting it should be a last resort. You should use a six-point socket, in order to prevent the bolt head from being rounded. This bolt can only be removed when the engine is slightly raised, be careful not to break the bolt head off when using a breaker bar. 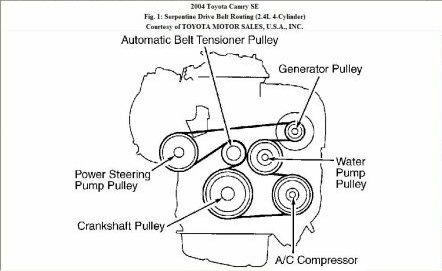 Installing a serpentine belt on a 2004 Toyota Camry, assuming the tensioner is not broken, is fairly straightforward. It is important, however, to make sure it is installed correctly on the pulleys. There is only one way it can go on, if you spend a bit of time thinking about it, you should be able to figure it out. However, the serpentine belt diagram on the right shows the correct installation on a 2004 Toyota Camry with a 2.4L 4 Cylinder Engine. By pushing down on the tension release bolt, which is 19mm, it is possible to relieve tension on the pulley, allowing the serpentine belt to be slid on. (continued) 2. To release the serpentine belt, I used a 3/8 inch socket wrench with 19mm socket, and a 2 foot long pipe. After putting the socket wrench on the tensioner's front bolt head (not really a bolt, just a bolt head welded to tensioner) I slipped the pipe down on the wrench and pulled forward, i.e., clockwise. (continued) 3. The top bolt securing the tensioner was extremely hard to turn. I had to use my pipe again on it; and, it felt like it was going to break the bolt. I used the pipe and a hammer to hit it sharply several times to loosen it some, and it did come out without breaking. But, during reinstallation it would hardly turn. I pulled it back out, cleaned out the hole and added. Still was hard to screw back in. By far, this bolt was the hardest part of the job. Glad you got it working getterdun and thanks for your comments/input! I am always really nervous when using a pipe or something on a bolt like that, but sometimes the extra leverage is essential. I think that bolt gave me some issues too! I found that jacking up the engine was necessary to allow enough clearance for a long-handled ratchet with a 19MM 6-point DEEP socket to pull clockwise on the 19mm nut when installing the replacement serpentine belt. Without the deep socket (which will only fit if the engine is jacked up), my helper could not get his hand in position to work the belt over the last pulley (the smooth water pump pulley), because the ratchet head was in the way. Thanks for the comment Rivernerd! It has been awhile since I worked on the car, but I do believe it was a tight fit when I was doing it as well! Still lost since I see three bolts , actually two because one is only ahead bolt weld to the tensioner.The idea is to losse up the two bolts located one in the back close to power steering and one on top of crankfact, am i right? I dont get your way using the socket end the 19 mm. Joe, yes, if you are trying to replace the serpentine tensioner assembly on a Camry, then there are two bolts that you need to remove. You can see these in the red boxes in the above diagram. Otherwise, if you are just replacing the belt, you can use the 19mm bolt that is welded on to relieve the tension on the belt and should not have to remove any bolts. Unfortunately for us, someone had broken welded bolt head off on this Toyota, so we had to replace the whole tensioner assembly in order to get the belt back on. That is what is in the first image at the very top, the bolt head is missing on the dirty tensioner.